Rasa N16 in Stoke Newington is a must if you enjoy Keralan vegetarian and vegan food – it stands out for more reasons than one. There’s a wonderful vibrancy to Rasa N16, with its eye-catching pink street front, tantalising menu and friendly staff. This popular vegetarian restaurant was opened in 1994 by Das Sreedharan, who had come from Kerala, India, to study in London. Dissatisfied with the quality of Indian food in London, he wanted to bring the authenticity of Keralan home-cooking to the city. The result is a menu steeped in the flavours of the region, with an abundance of dishes to choose from. Vegan and gluten-free options are available, as are dishes free from onion and garlic. There are pickles, chutneys and pre-meal snacks to begin with: poppadoms, banana chips and crunchy seed sticks. 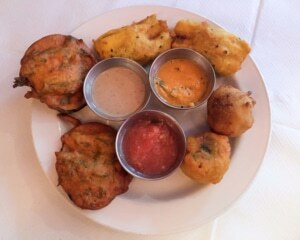 Then starters such as lentil cakes, fried plantains and a selection of savoury street snacks popular in South India. 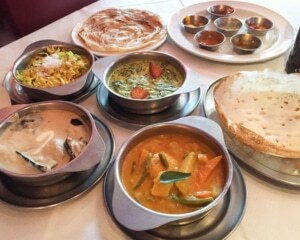 The mains are split into dosas and curries. Dosas, a type of crispy pancake made of rice flour and stuffed with vegetables, come in different styles with fillings such as potatoes, beetroot or onion. The menu lists almost a dozen curries: from tangy tomato dishes to spicy aubergine to paneer and spinach. To compliment the mains there’s a range of rice dishes, side dishes, soups and breads. And to follow, a choice of sweet treats – many of which are made with fruit and flavoured with cashews and raisins. The ‘Kerala Feast’ is a great option if you’re tempted by more than one dish. At £17 a person, it samples from the entire menu: it really is a feast. There’s a lively yet relaxed atmosphere in the restaurant. Due to its relatively small size, the tables are set fairly close together, but the music volume is low and acoustics are good, so conversations feel intimate. The service is friendly and attentive, and the staff are happy to recommend dishes based on your likes or dietary requirements. 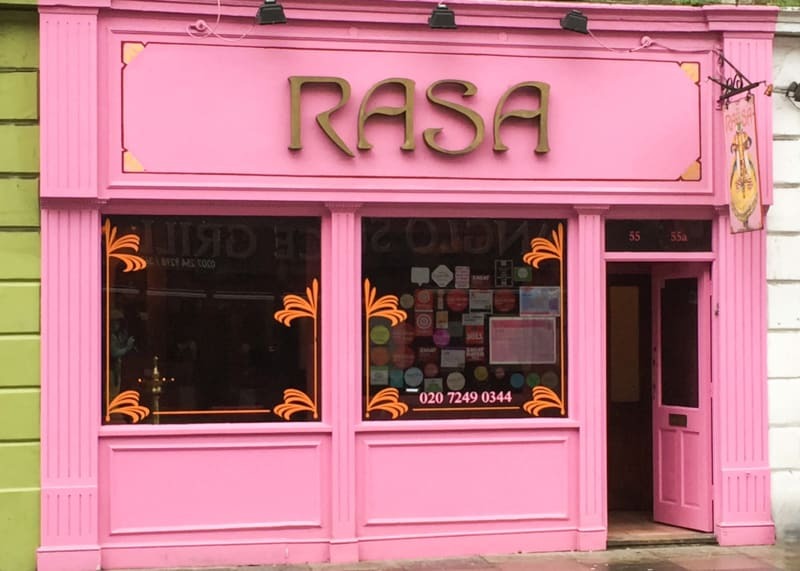 There’s now a chain of Rasa restaurants in London and India that, unlike Rasa N16, serve omnivorous options as well as vegetarian food (one of which, Rasa Travancore, sits across the street). But Rasa N16 was the first of them and, for veggies and vegans, it remains the best.